Canal Quarters lockhouses are popular for their historic charm, proximity to the towpath, and unique overnight lodgings. 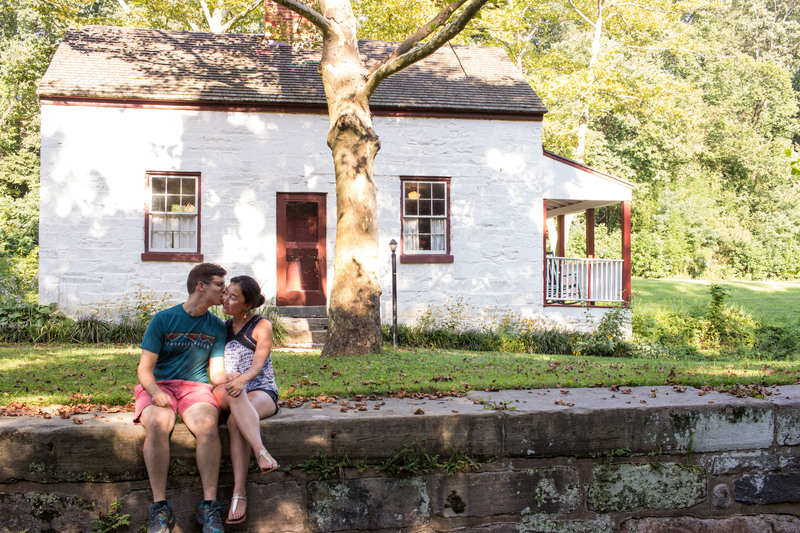 Through the years, the lockhouses have also been the destination for marriage proposals. Recently, George Marshall contacted us to relate his story about his recent experience at Lockhouse 6. 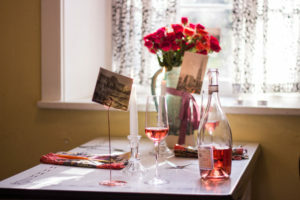 “Because we first met in Vienna, Austria while we were studying there in 2011, I decorated with vintage postcards of Vienna and cooked schnitzel and German potato salad. As they were driving back to our apartment, I called to say I had popped my bike tire and needed her to pick me up. She met me at the parking lot beside the lockhouse and I told her there was a self-guided tour she should check out. She was completely surprised when she walked inside! I had my camera ready for her friend to take photos and after dinner we walked down to the river to watch the sunset”. 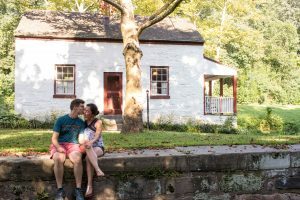 “We had a magical stay in the 200 year-old lockhouse and the canal will forever have a place in our hearts.” We wish George and his love a wonderful life together! Lockhouse 10 has also had its share of love connections. 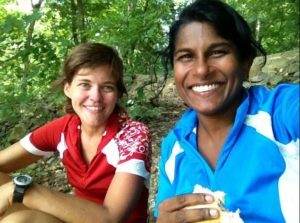 Katie Kelly and Suji Brown took a camping trip several years ago to celebrate Suji’s birthday and stayed at Lockhouse 49. Both loved the experience and have since enjoyed multiple stays at Lockhouse 6 and 10. “It’s a marvelous experience”, says Suji. They loved Lockhouse 10 so much that it was quickly apparent where they should get married. On June 26, 2015, they were married on the bridge at Lockhouse 10 in a small, intimate ceremony. According to Suji, Lockhouse 10 is a great place to sit on the porch with your coffee in the morning and watch the people go by on the towpath. Listening to the evening sounds of the forest, as well as daytime biking and just hanging out make this a very special place. Marcia Carlson and Mark Sauer had their first date at Lockhouse 10 on June 2, 2013. Marcia is a Quartermaster at the lockhouse and was in the midst of her duties when Mark arrived. He jumped right in and helped clean so they could have a picnic lunch afterwards. Mark’s help swept her off of her feet, leading to a second date. Since then, Mark has assisted with Quartermaster duties and participated in annual work parties at the lockhouse. One day, Mark and Marcia were in the middle of their Quartermaster duties – she was doing inventory while he mowed and trimmed the yard. 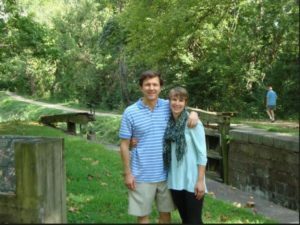 This time, when they sat down at the same picnic table from their first date, Mark proposed! Find out for yourself what makes the Canal Quarters lockhouses so special. Learn more about this award-winning program and book your own stay at https://www.canaltrust.org/programs/canal-quarters/.